Andrew Neiman (Miles Teller) is a talented drummer — talented enough to make it into Manhattan’s prestigious music conservatory, Schaffer Academy. There’s no bigger badge of approval at Schaffer than to be invited to join its elite jazz band, which is run by the tough and mysterious Terence Fletcher (J.K. Simmons). Fletcher has groomed some of jazz’s best players, but pleasing him is a minefield. Fletcher’s methods include — among other, more traditional methods like pedagogy and charismatic history-sharing — complete and utter humiliation. Andrew is thrilled to make the initial cut, but surviving Fletcher’s class may break him, and his love for music, for good. I was very impressed by this movie. The cast, the directing, the script, and the style of the movie are all great. Miles Teller and J.K. Simmons both did an amazing job, and I think they both have a chance of getting an Oscar nomination. I thought the story and dialogue were great, too. The directing is excellent, and I think this is a huge breakthrough for Damien Chazelle, the director of the movie. This is a type of movie that really made me think. The ending of the movie really made me go, “Wow!”. The movie delivers the message that you have to try as hard as you can in order to succeed. The style was great, and I liked how it felt like a very musical film. The cinematography was also great. This isn’t my favorite movie of the year, but possibly on my top 5 or top 10. It’s a great film and I would definitely recommend it, but only for ages 14 and up, because there is some very strong language. 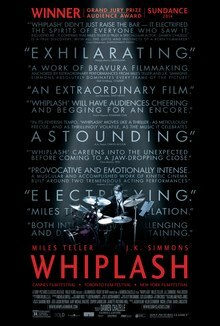 This entry was posted in Drama and tagged drama, drummer, j.k. simmons, jk simmons, miles teller, movie reviews, movies, whiplash, whiplash movie. Bookmark the permalink. We saw this movie and we loved it as much as you did. The dreadful path of humiliation, suffering and sacrifice that Andrew had to undergo in order to be where he was at the end of the movie made me think: ‘was it all worthwhile”?! He gave up his love life, his family life, his self esteem, his dignity as a human being, actually his whole being! I don’t think that any person who wants to succeed in life has to go that far. That was too extreme.True, you always have to do your utmost, but there is more in life that success in one’s career. There is love, there is family, there are hobbies and friends, all of which enrich one’s life in so many ways.